Mark your calendars! This next Monday, July 29th, evening, 7PM, at the Rod Shippey Hall located near headquarters, the UC Hopland Research & Extension Center will hold its first monthly, free open-to-the-public, seminar presentation. Coffee and light refreshments will be provided. Doctoral candidate Dan Preston, from the Department of Ecology and Evolutionary Biology at The University of Colorado, Boulder, will be the presenter. 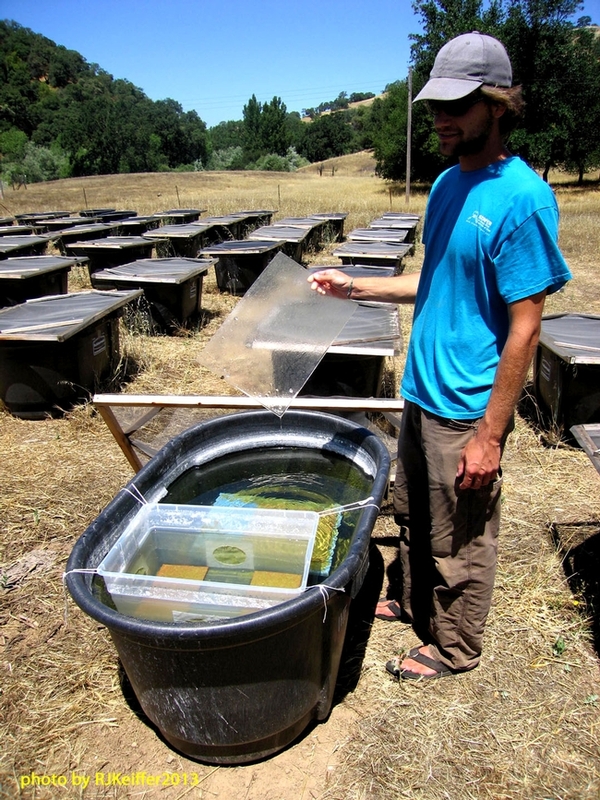 Dan's program titled "Freaky Frogs and Fecund Fish: Ecology of Frog Deformities and Biological Invasions in North Coast Wetlands", is based upon several years of field research, primarily at HREC vernal pools, natural sag ponds, man-made ponds, and artificial mesocosms. Here you see Dan, out-standing in his field of mesocosms, intently investigating freshwater snail egg masses on a plexiglass plate. Come hear more on Monday ... see you there!